To be added to periodically with assortments. (Others of course can post anything they find also). 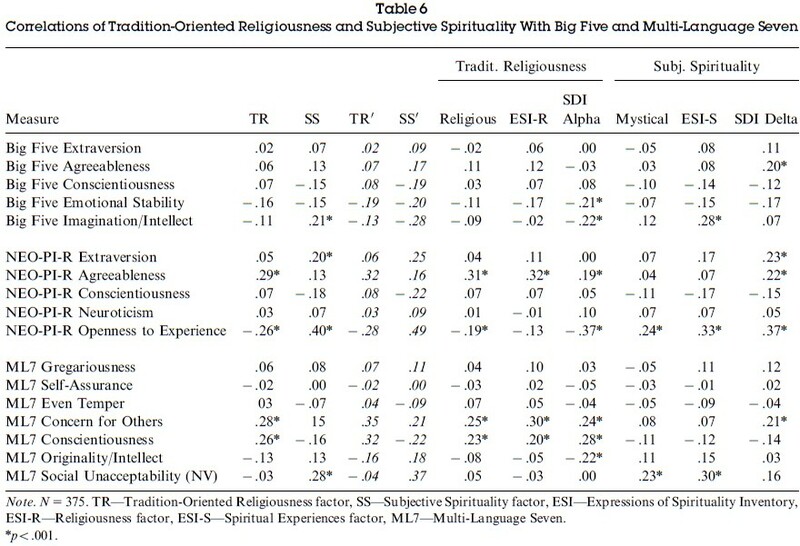 I would ideally like to see correlations between the eight Jungian functions and measures such as the Big Five, IPIP, the enneagram etc., and also, correlations between relationship success/happiness/length etc. I have found very little - and nothing in regards exactly what I want. (It is known for example that extroversion, conscientiousness, and low neuroticism in the Big Five are correlated with successful relationships). 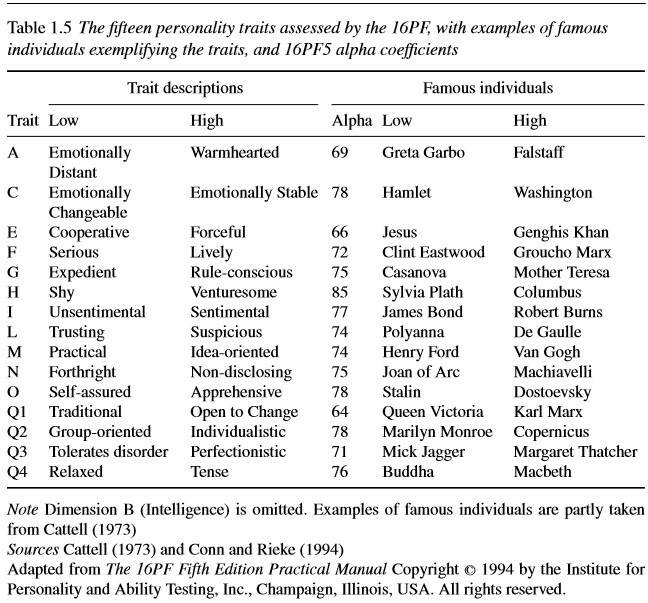 An empirical investigation of Jung’s psychological types and personality disorder features. 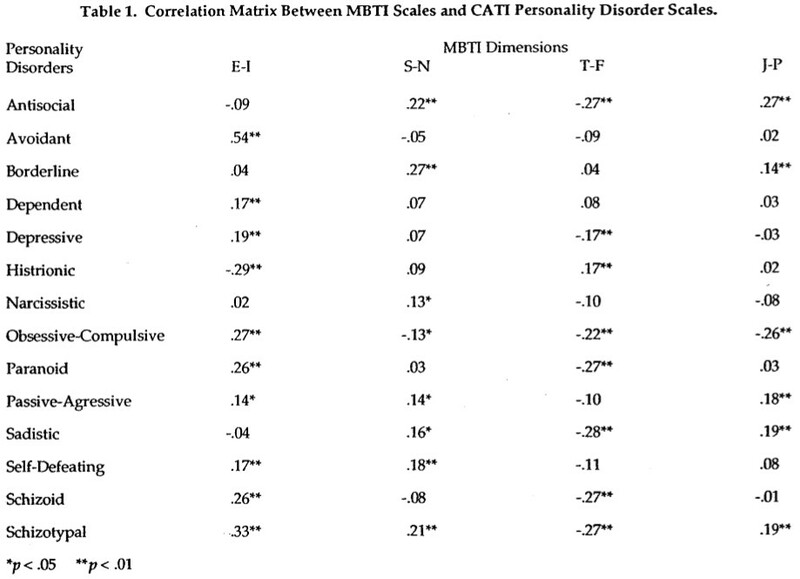 Correlations between each disorder at the 99% confidence level (with each MBTI scale in order of strength of correlation: the letters in brackets are the scales in MBTI "order"): after the semi-colon (if present) are correlations at the 95% confidence level. Last edited by Subteigh; 04-11-2017 at 07:06 PM. 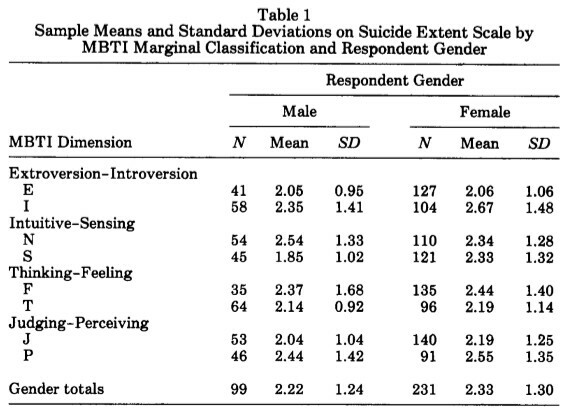 Study participants were asked to respond on a 6-point scale according to the most extreme extent they had experienced suicidal ideation or actions: actual attempt (6), some planning (5), serious consideration (4), entertained thoughts (3), idle thinking (2), and never considered (1). 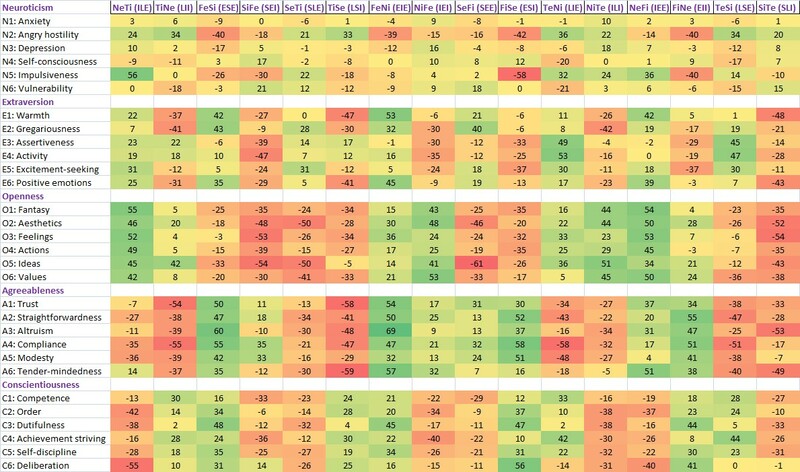 (The average score is in the "Mean" columns). Last edited by Subteigh; 05-07-2016 at 12:58 AM. 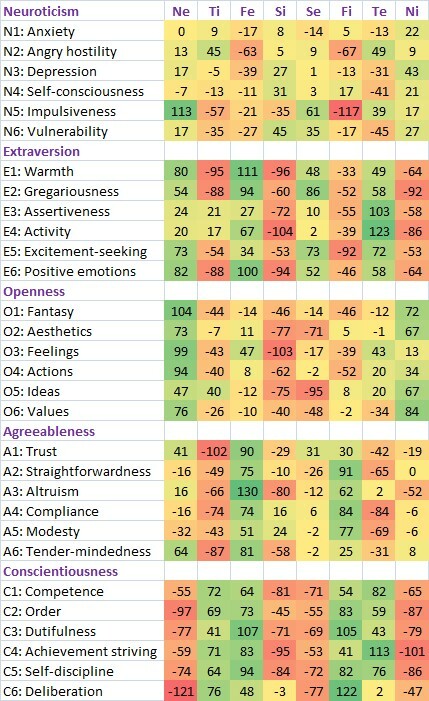 Type scores from the above chart (^), assuming that the primary function makes up up two-thirds of a person's Ego, and the secondary function makes up one-third. This basically tells you, for example, in the case of NeTi (ILE)...or perhaps "pseudo"-ILE, how it might theoretically score for each trait. Perhaps rather limited. 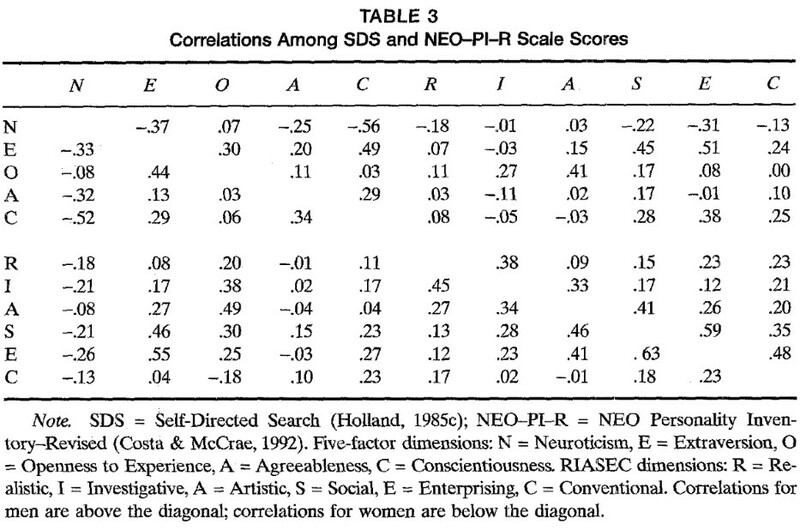 Correlations between Big Five traits and Holland codes. Last edited by Subteigh; 05-22-2016 at 12:02 AM. 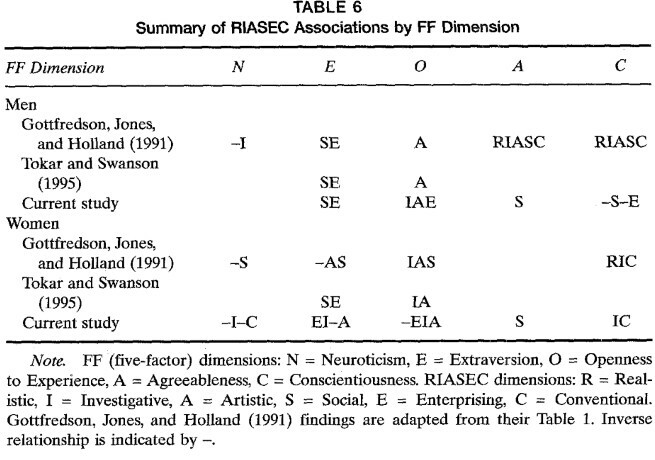 Correspondence between five-factor and RIASEC models of personality. Schinka JA, Dye DA, Curtiss G.
The subjects were asked to pick their most preferred color and their least preferred color of the four given. Blue was chosen as the most preferred color among both sexes. In the younger group the order from most preferred to least preferred was blue, red, green, then yellow. For the older group the order of color preference from most preferred to least preferred was blue, green, red, then yellow. Yellow was the least preferred color in both groups. In this study it shows that gender doesn’t make a difference in color preference. It was age that was the divider (Dittmar, 2001). However, this study leaves a lot of room for changes for more consistent and accurate studies. Once again there was an uneven amount of male and female participants in the study which in turn begs to question whether or not the data collected is accurate or significant. The study did not represent a certain color or shade of the color so it was up to the participant to determine what they likes which leaves too much room for participant’s creativity. There was also an age gap from 44 to 52 years of age. The fact that there was not a consistent color or colors to choose from leaves room for error. Lange and Rentfrow referenced a study done by Stone on Designing Effective Study Environments showing that the mood of workers tended to be much more positive when working in a blue environment rather than a red one. The arousal of the individual was much higher when working in the red environment so that when they were asked to do a more thrilling task the red color interfered with their performance. Lange and Rentfrow also referenced Luscher and Scott on their studies of Personality and their color test. Their findings found that introverted people, i.e. people with high internal arousal, preferred much cooler colors like blues and greens because they reduced their inner arousal. On the flip side, extroverts, i.e. people with low internal arousal, were drawn to warmer colors such as reds and oranges to increase their inner arousal. Lange and Rentfrow also state that readers read slower and comprehend less when reading in a red environment. This suggests that color effects cognitive arousal which in turn can effect, or even hinder, cognitive performance. Looking at the Murray and Deabler’s study on mood-tones, their results indicated the association between mood and color. Their cross-regional study that corresponded with an earlier study by Wexner, proved that Americans across the board associate colors to moods, however, not always in the same way. The subjects were given a set list of words and a set of eight colors in the form of 8.5x11 inch pieces of paper, they were then asked to select the color that best represents the word in the word list. Both Wexner and Murray and Deabler’s studies had variations and differences, but they also had some definite similarities. Blue and green were consistent among both studies. The participants overwhelmingly related these two colors with the words Secure, Tender and Calm. These colors were also somewhat systematically not relevant to the word Defiant. Contrasting evidence showed that Red was most correlated with Defiant, Cheerful, Exciting, and Powerful and was by and large not associated with Secure, Tender, and Calm. Indicating that certain colors correspond with certain moods and those certain colors elicit the same strong emotional responses consistently among different groups of people. Leon, Gillum, Gillum, and Gouze concentrated a portion of her research to looking at personality stability. Her longitudinal study obtained substantial evidence towards personality stability on an individual level. Using the MMPI, she gathered data 4 different times from the same 71 men over a 40 year period. The group of emotionally stable and physically healthy men was reported, in her study, to have a significant degree of personality stability over the 40 years span. The MMPI scores of the men’s tests were fairly consistent with some minor fluctuations, supporting that personality is stable over time. Wanna hook me up with a thread TL;DR? Nobody tried to compare(correlate the categories between) the big5 and MMPI? I will have a look some time in the semi-distant future. The objective of this study was to evaluate differences in college students’ dietary intake and quality in relation to their Myers Briggs Type Indicator (MBTI) personality preferences. Students from three large introductory nutrition classes and 26 other classes were recruited to participate. Students (n = 302) completed a scannable version of the food frequency portion of the National Cancer Institute's Health Habits and History Questionnaire (NCI-HHHQ) and the MBTI. Dietary intake was compared using an adapted version of the Diet Quality Index (DQI), a multidimensional indicator of quality, and the recommended servings from the Food Guide Pyramid. Differences were determined by grouping the students according to their personality preferences and applying analysis of variance. Students preferring Extraversion, Intuition, or Judgment had tendencies for better dietary habits. Although some differences existed between men and women, Extraverts, in general, in comparison to Introverts, had higher intakes of grain, fruit, and dairy servings, with an overall superior DQI and a lower percentage of kcalories from fat; however, they also had a higher percentage of kcalories from alcohol. Intuitive women, in comparison to Sensing, had a superior DQI, consumed more fruit servings and breakfasts per week, and had a lower percentage of kcalories from sweets. Women preferring Judgment, as compared to those preferring Perception, consumed a significantly lower percentage of kcalories from alcohol and more frequent breakfasts. Suggestions for future research and for improving nutrition education are made based upon the link between certain personality preferences and dietary quality. During the past decades, a number of studies have explored personality group differences in the Big Five personality traits among students in different academic majors. To date, though, this research has not been reviewed systematically. This was the aim of the present review. A systematic literature search identified twelve eligible studies yielding an aggregated sample size of 13,389. Eleven studies reported significant group differences in one or multiple Big Five personality traits. Consistent findings across studies were that students of arts/humanities and psychology scored high on Neuroticism and Openness; students of political sc. 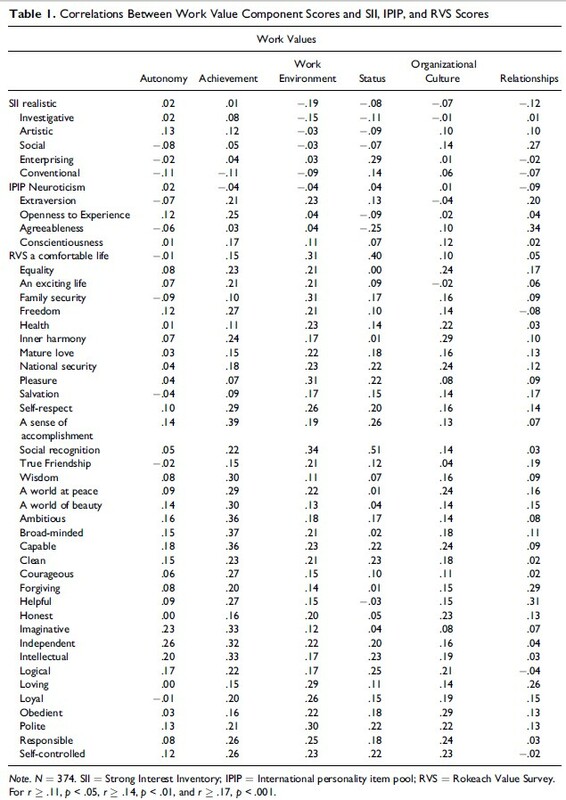 scored high on Openness; students of economics, law, political sc., and medicine scored high on Extraversion; students of medicine, psychology, arts/humanities, and sciences scored high on Agreeableness; and students of arts/humanities scored low on Conscientiousness. 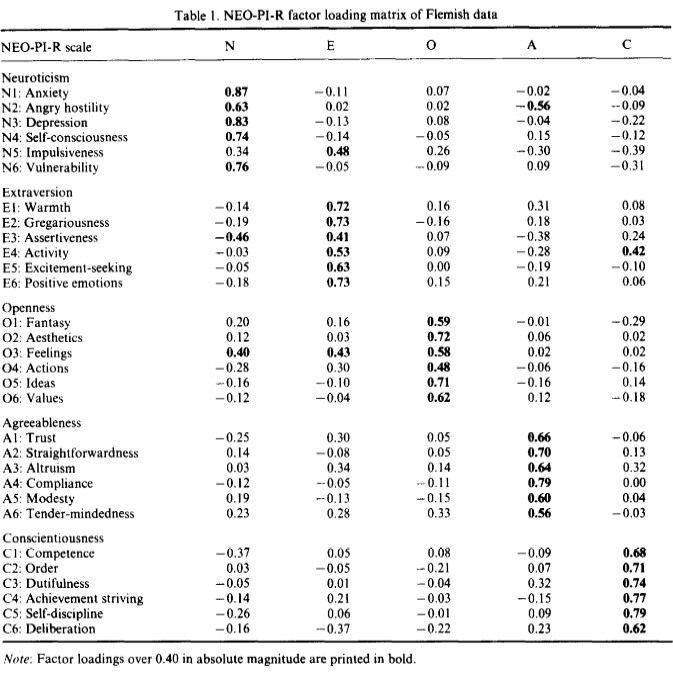 Effect sizes were calculated to estimate the magnitude of the personality group differences. 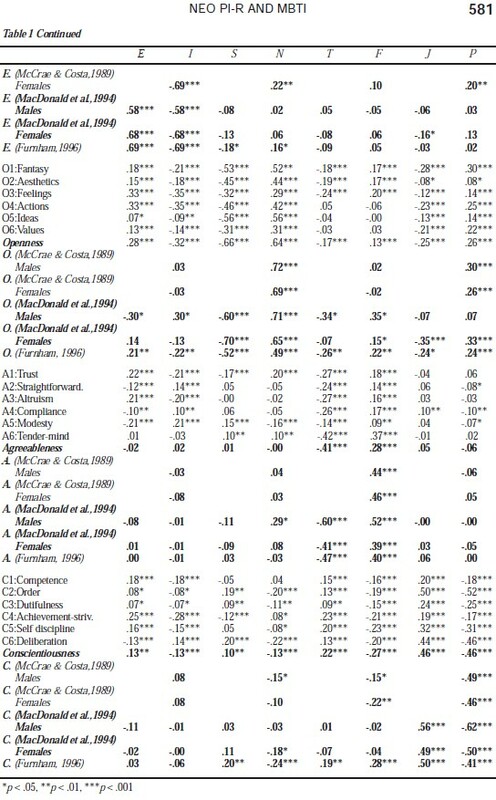 These effect sizes were consistent across studies comparing similar pairs of academic majors. 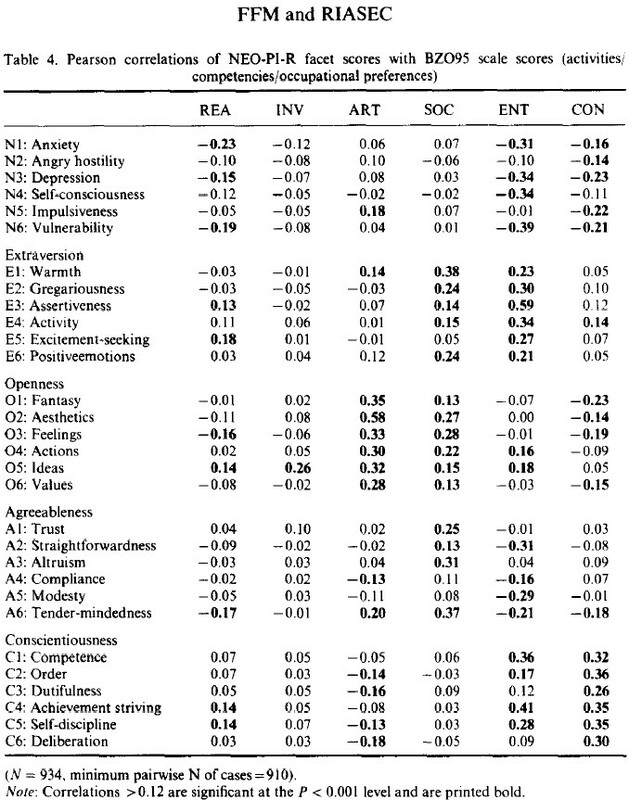 For all Big Five personality traits medium effect sizes were found frequently, and for Openness even large effect sizes were found regularly. The results from the present review indicate that substantial personality group differences across academic majors exist. Implications for research and practice are discussed. I found the following in a text file on computer dated from about a month ago (I think I must have been intending on gathering more studies together, because two of these studies are small, and because there seemed to be quite a lot of variability when I was looking into it before. I am posting it nonetheless). Roy Oswald and Otto Kroeger of the Alban Institute collected data about Myers-Briggs personality types for more than 1,300 clergy. The selection of clergy was not random, so may not be representative of the entire clergy population, but information is still interesting. Of the 16 Myers-Briggs types, these three were the most frequent. Psychological Types of Male Evangelical Missionary Personnel Training in England: A Role for Thinking Type Men? 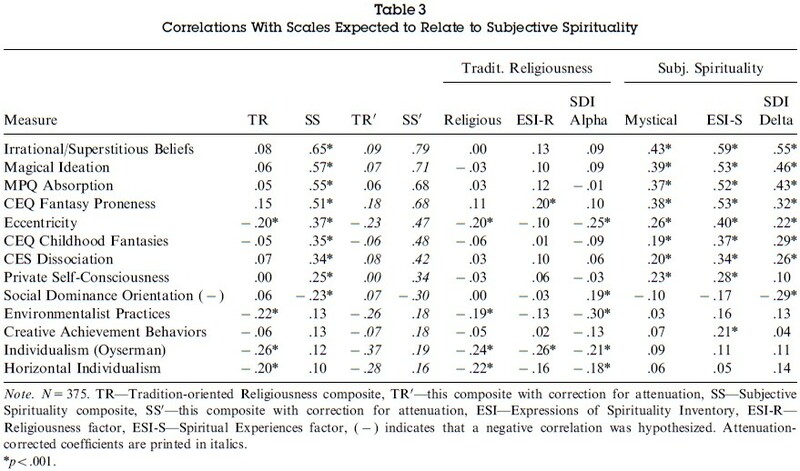 A sample of 92 male evangelical missionary personnel completed Form G (Anglicised) of the MBTI. The two predominant types among this group were ESTJ (24%) and ISTJ (15%). In the group as a whole there were clear preferences for extraversion over introversion, for sensing over intuition, for thinking over feeling, and for judging over perceiving. This study explores the psychological type profile of Roman Catholic priests serving in the United States, drawing on data provided by 55 priests who completed the Francis Psychological Type Scales. The data demonstrated clear preferences for introversion (67 %), sensing (64 %), and judging (91 %), and for a balance between thinking (49 %) and feeling (51 %). 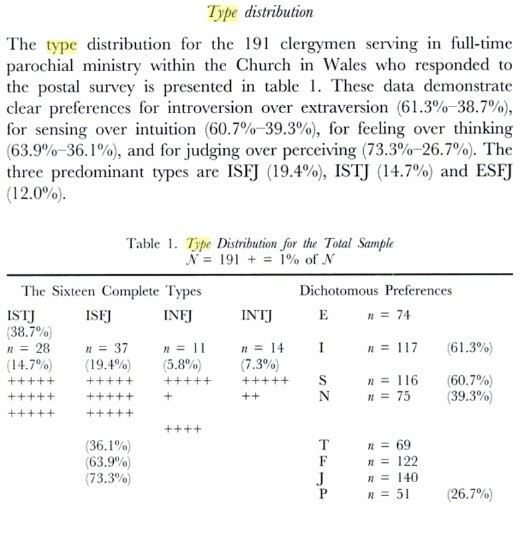 A very high proportion of priests reported preferences for ISTJ (27 %), compared with 16 % of men in the U.S. population. Implications of these findings are discussed for ministry in the Roman Catholic Church. 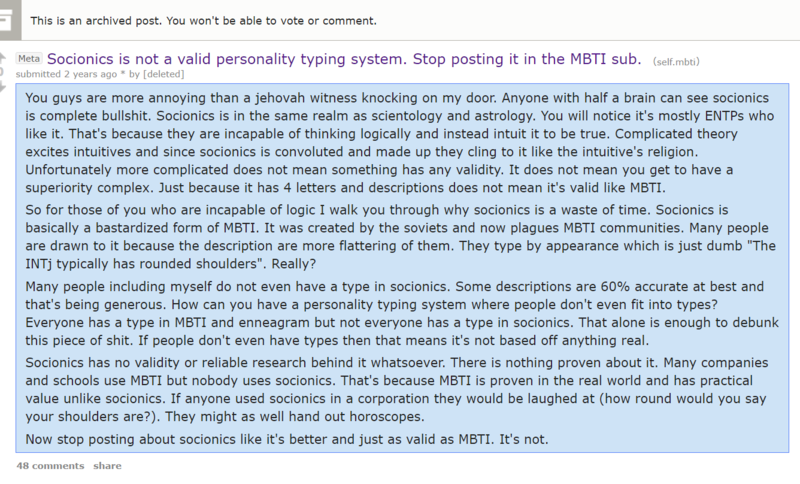 TL;DR: MBTI has no reliability nor accuracy. In socionics I think they tend to be ENxp. I somehow ended up on this reddit but can't remember how. People are all the same when it comes to defending their strongest belief systems... the irony doesn't escape me. I doubt the majority of the people are typed correctly so they all have no reliability. I doubt that priests are mainly S too because S are more down to earth generally. oh god...that is rather terrible. A general consensus on the Big Five model of personality attributes has been highly generative for the field of personality psychology. 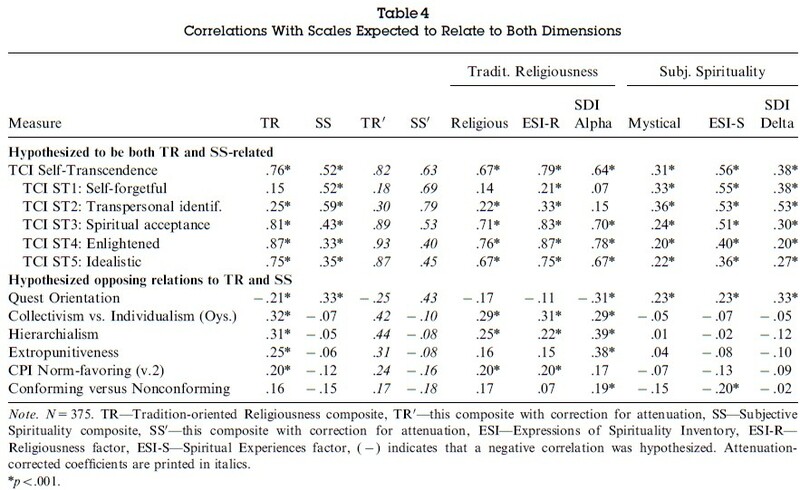 Many important psychological and life outcome correlates with Big Five trait dimensions have been established. But researchers must choose between multiple Big Five inventories when conducting a study and are faced with a variety of options as to inventory length. Furthermore, a 6-factor model has been proposed to extend and update the Big Five model, in part by adding a dimension of Honesty/Humility or Honesty/Propriety. 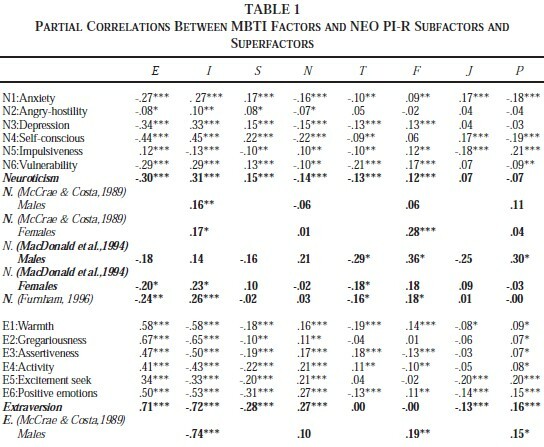 In this study, 3 popular brief to medium-length Big Five measures (NEO Five Factor Inventory, Big Five Inventory [BFI], and International Personality Item Pool), and 3 six-factor measures (HEXACO Personality Inventory, Questionnaire Big Six Scales, and a 6-factor version of the BFI) were placed in competition to best predict important student life outcomes. The effect of test length was investigated by comparing brief versions of most measures (subsets of items) with original versions. Personality questionnaires were administered to undergraduate students (N  227). Participants’ college transcripts and student conduct records were obtained 6–9 months after data was collected. 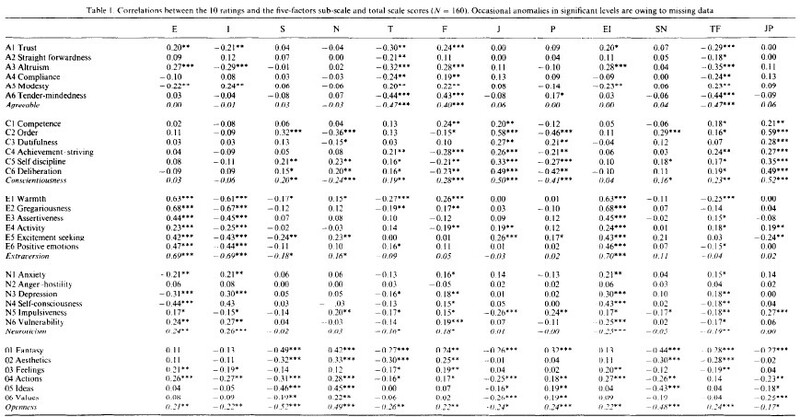 Six-factor inventories demonstrated better predictive ability for life outcomes than did some Big Five inventories. Additional behavioral observations made on participants, including their Facebook profiles and cell-phone text usage, were predicted similarly by Big Five and 6-factor measures. A brief version of the BFI performed surprisingly well; across inventory platforms, increasing test length had little effect on predictive validity. Comparative validity of the models and measures in terms of outcome prediction and parsimony is discussed. Interesting that logicals are so disordered. Maybe because they are more logical with their disorder - I am ill so therefore I am doing ill things hehe. But seriously, it looks weird as ethicals were less likely to have personality disorders. This surprised me, too. The only guess I have is that ethicals, being more in touch with their feelings, may be better at regulating them and keeping them healthy (on average). Edit: although unfortunately this doesn't apply to me, since I'm dealing with depression. blegh.